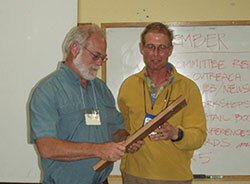 This past weekend (April 12-14, 2013) I attended the annual CASBA conference at Walker Creek Ranch in Marshall. I had a wonderful time meeting old and new people but the weather, though sunny, was very windy which kept most of us indoors. The conference used a “colloquium” process for the schedule, new to most of us. Friday night after most people had arrived, those interested were asked to lead a one hour session on whatever issues might interest us. A loose schedule was then set up for Saturday and Sunday. At times 3 sessions filled a time slot and those I attended were sometimes new subjects I had not experienced at previous conferences. Some were lectures and some were great discussions and ranged from topics such as Cost/Value of Straw Bale, Net Zero Building to How to Best Use Social Media for Our Cause and many other subjects. 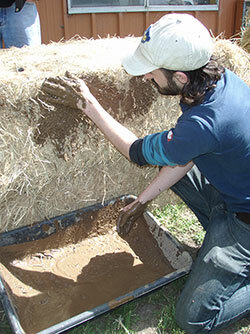 They refreshed my interest in the cause of straw bale building. The first evening some of the original CASBA people, Turko, Greg, Chris and Ann told some of their stories. Saturday afternoon our keynote speaker, David Easton, spoke to us. 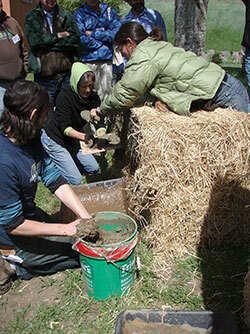 He is a long-time luminary in the local green building world and founder of Rammed Earth Works. I enjoyed hearing stories about his family, his experiences with rammed earth and his present projects, all told with some humor. After dinner, we had a session called 5 X 5. Each person who volunteered had 5 minutes to show 5 slides and talk about them. We saw some great examples of straw buildings along with other subjects. The Board meeting was held Friday afternoon before everyone else arrived and many issues were discussed including the transition of directors. Maurice and Joy Bennett are passing the job of Directors of CASBA to David Arkin. This was announced at the general meeting on Saturday. The transition will be mutually handled over a period of time and everyone thanked Maurice & Joy for the 14 years of their service. .We all signed a large banner with comments and gave it to them at the end of the conference. Each evening ended with social time in the barn which included music, drinks and dancing, complete with a disco ball and laser lights. And as we all left on Sunday, I felt renewed energy in my purpose within the organization and hope everyone else did too. 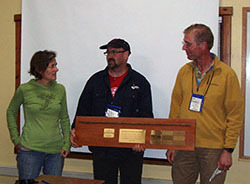 Thanks to Carol Venolia, CASBA Member, for sharing her photos and to Jim Furness for the Photo of Maurice and Joy! 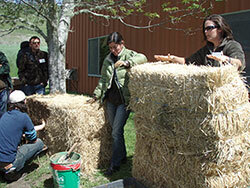 What Would You Do Differently When Building with Straw? Thanks to Jim Reiland for providing this list.